Renal papillary necrosis (RPN) is characterized by coagulative necrosis of the renal medullary pyramids and papillae brought on by several associated conditions and toxins that exhibit synergism toward the development of ischemia. The clinical course of renal papillary necrosis varies depending on the degree of vascular impairment, the presence of associated causal factors, the overall health of the patient, the presence of bilateral involvement, and, specifically, the number of affected papillae. Renal papillary necrosis can lead to secondary infection of desquamated necrotic foci, deposition of calculi, and/or separation and eventual sloughing of papillae, with impending acute urinary tract obstruction. Multiple sloughed papillae can obstruct their respective calyces or can congregate and embolize to more distal sites (eg, ureteropelvic junction, ureter, ureterovesical junction). Previously undiagnosed congenital anomalies (eg, partial ureteropelvic junction obstruction) can provide a narrowed area where the sloughed papilla can nest and obstruct. Renal papillary necrosis is potentially disastrous and, in the presence of bilateral involvement or an obstructed solitary kidney, may lead to renal failure. The infectious sequelae of renal papillary necrosis are more serious if the patient has multiple medical problems, particularly diabetes mellitus. In 1877, Friedrich first described renal papillary necrosis in a patient with urinary obstruction resulting from hypertrophy of the prostate. Later, Gunther  and Edmondson et al  described renal papillary necrosis as a lesion associated with diabetes. Since then, researchers have reported that 17-90% of all patients with renal papillary necrosis have diabetes and that 25-73% of patients have severe urinary tract obstructions. In 1945, Spuhler and Zollinger documented the first description of analgesic nephropathy. Since then, analgesic abuse has been increasingly significant in the development of papillary necrosis, particularly in Australia, England, and Scandinavia. Reports indicate that Beethoven, the highly regarded musical genius and among the best composers of all time, was a long-term abuser of alcohol and analgesics. Beethoven was prone to headaches, back pain, and attacks of rheumatism or gout. His physician often prescribed salicin, a commonly used analgesic substance at that time, which was made from dried and powdered willow bark. His alcohol abuse was compounded by a viral hepatitis infection that led to liver cirrhosis and chronic pancreatitis. Davies postulated that Beethoven developed diabetes mellitus secondary to chronic pancreatitis. Beethoven had no reported history of urinary obstruction, nor was it mentioned in his autopsy report. Researchers postulate that Beethoven's renal papillary necrosis was most likely a consequence of analgesic abuse and decompensated liver cirrhosis, which ultimately caused his death. Davies contests that Beethoven also had diabetes and that this illness was the primary risk factor for him developing renal papillary necrosis. Indeed, all 3 conditions may have been synergistic factors. Renal papillary necrosis is sometimes classified as one end of a spectrum of changes associated with pyelonephritis and tubulointerstitial nephritis. Renal papillary necrosis is often considered a complication or extension of severe pyelonephritis that is more devastating than usual because of associated disease states, particularly diabetes and urinary tract obstructions. Other sources believe this consideration is inaccurate and archaic because renal papillary necrosis does not usually occur with florid pyelonephritis. Indeed, pyelonephritis and an ascending urinary tract infection are conditions that are commonly associated with renal papillary necrosis. Infection is a frequent and important finding in most cases, contributing significantly to the clinical presentation of renal papillary necrosis (ie, fever and chills in approximately two thirds of patients, positive urine culture results in 70%). However, renal papillary necrosis can occur in the absence of infection, indicating that infection may not be the primary process in the pathogenesis. Conversely, infection is likely a complication of renal papillary necrosis; the necrotic papillae act as a nidus for infection and lithogenesis. Infection within necrotic material and calculi is often difficult to definitively treat with antibiotics alone, and infection often recurs as renal papillary necrosis progresses to chronic pyelonephritis. Renal papillary necrosis is considered a sequela of ischemia occurring in the renal papillae and the medulla. Various insults generate this ischemia, one of which may be infection. The boggy inflammatory interstitium of the pyelonephritic kidney compresses the medullary vasculature and, thus, predisposes the patient to ischemia and renal papillary necrosis. This vasculature can become compressed, attenuated, or impaired from several other associated diseases, most notably diabetes mellitus, urinary tract obstruction, and analgesic nephropathy. Therefore, renal papillary necrosis is a distinct clinical and pathophysiological entity primarily caused by ischemia that can develop without pyelonephritis or urinary tract infection and is likely a focus for infectious complications. Renal papillary necrosis has a well-documented association with several diseases that predispose a patient to ischemia. Renal papillary necrosis is primarily a bilateral process, as is expected considering the systemic nature of the associated diseases and the ischemic pathophysiologic mechanism of renal papillary necrosis. Reports indicate that, among patients in whom a single kidney is involved at initial presentation, the contralateral kidney will develop renal papillary necrosis within 4 years. Physicians diagnose true unilateral renal papillary necrosis when the patient's predisposing factor is infection or obstruction that is limited to one kidney, as is the scenario in a patient with congenital ureteropelvic junction obstruction. Renal papillary necrosis generally affects individuals who are in the middle decades of life or older. The typical patient is aged 53 years, with nearly half of cases occurring in individuals older than 60 years and more than 90% of cases occurring in individuals older than 40 years. Renal papillary necrosis is uncommon in individuals younger than 40 years and in the pediatric population, except in patients with sickle cell hemoglobinopathies, hypoxia, dehydration, and septicemia. Analgesic nephropathy, another associated condition and causal factor of renal papillary necrosis, is also more common in women than in men. Analgesic nephropathy is particularly prevalent in individuals with recurrent headaches or chronic, unremitting muscle and joint pain and in patients with psychoneuroses. Occupational risks are not associated with developing renal papillary necrosis. Generally, any condition associated with ischemia predisposes an individual to papillary necrosis. Important general considerations include shock, massive fluid sequestration (eg, as in pancreatitis), dehydration, hypovolemia, and hypoxia. Certain conditions have a known association with renal papillary necrosis, and the underlying mechanism of these conditions is ischemia, which ultimately leads to renal papillary necrosis. More than half the patients with renal papillary necrosis have 2 or more of these causative factors. Thus, renal papillary necrosis in most patients is multifactorial in origin, and physicians must consider the pathogenesis of renal papillary necrosis a combination of detrimental factors that overlap and operate in concert to cause renal papillary necrosis (see image below). In this figure, the multifactorial nature of renal papillary necrosis is represented by 5 of the disease's most frequently associated conditions: infection, obstruction, diabetes mellitus, analgesic abuse, and sickle cell disease. 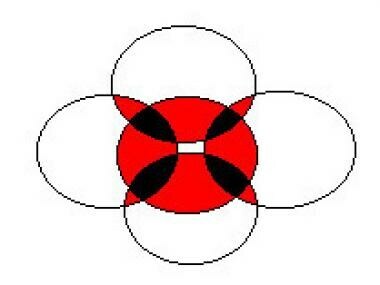 Each circle represents a condition. Note how the conditions overlap; the red areas show the coexistence of 2 conditions, and the black areas represent 3 coexistent conditions. Multiple conditions exhibit synergism and, therefore, worsen both the severity of the disease and the prognosis. One of the most common and most preventable etiologic factors is the use of analgesics. A classic factor is phenacetin, with its highly toxic metabolite, p-phenetidin. Recently, however, the rising popularity of nonsteroidal anti-inflammatory drugs (NSAIDs), particularly those that inhibit cyclooxygenases (ie, COX-1, COX-2) has led to a relatively high frequency of adverse events in patients at risk for renal papillary necrosis. In healthy individuals in whom renal arterial blood flow is not compromised, NSAIDs have little effect unless they are used in excess. This is mostly true because the kidney is not relying on the vasodilatory effects of prostaglandin to supply adequate perfusion. However, in patients who are predisposed to renal hypoperfusion, local prostaglandin synthesis protects the glomeruli and tubules from ischemia. The inhibition of prostaglandin synthesis by NSAIDs that inhibit COX-1 and, as recently reported, COX-2, removes this protective mechanism and predisposes the kidney to further renal hypoperfusion and, ultimately, ischemia. An extremely important precaution is to strictly monitor patients with prior renal disease or any of the above-mentioned etiologic conditions when prescribing NSAIDs. Additionally, note that a short course of NSAIDs has caused papillary necrosis and nonoliguric renal failure in otherwise healthy individuals as young as age 17 years. A case such as this may be an anomaly, but caution is warranted when prescribing NSAIDs, and adequate hydration is recommended. These precautions should also be extended to patients receiving specific COX-2 inhibitors. Touted as being safer than COX-1 inhibitors because they spare the gastrointestinal tract, COX-2 inhibitors have been shown to significantly decrease renal medullary prostaglandin levels. Therefore, care should be exercised when administering even the COX-2 inhibitors to patients with a predisposition to renal disease or renal papillary necrosis, and otherwise healthy patients should maintain adequate hydration and avoid physiologic stress while on these medications. Renal papillary necrosis is classified as focal (ie, involving only the tip of the papilla) or diffuse (ie, involving the whole papilla and areas of the medulla), depending primarily on the patient's degree of impaired vasculature. Renal papillary necrosis may simply affect a single papilla, or the entire kidney may be grossly involved. Once again, renal papillary necrosis is more often a bilateral process; many of the predisposing factors are systemic. Renal papillary necrosis never involves the entire medulla; the disease is always strictly limited to the inner, more distal zone of the medulla and the papilla. Researchers recognize 2 pathologic forms of renal papillary necrosis—the medullary form and the papillary form. The pathogenic form is dictated by the degree of vascular impairment. The medullary form is characterized by intact fornices, discrete grain-sized necrotic areas, and later defects in the papillae. Clinicians often observe sinus tracts extruding from irregular medullary cavities. In the papillary form, the calyceal fornices and the entire papillary surface are destroyed, demarcated, and sequestered. If these fornices and papillary surfaces are not sloughed, they reepithelialize and acquire a smoother appearance. Patients with medullary ischemia develop decreased glomerular filtration rates, salt wasting, an impaired ability to concentrate, and polyuria because the vasa rectae supply the medulla and serve the countercurrent exchange mechanism. The pathologic findings on a cut section include gray-white to yellow necrosis that resembles infection on the tips or distal two thirds of the pyramids. Microscopically, the tissue shows characteristic coagulative infarct necrosis, with preserved tubule outlines. The leukocytic response is limited to the junctions between preserved and destroyed tissue. After the acute phase, scars that can be observed on the cortical surface as fibrous depressions replace the inflammatory foci. This pyelonephritic scar is usually associated with inflammation, fibrosis, and a deformation of the underlying calyces and pelvis. Papillary necrosis is easily induced experimentally by administering a combination of aspirin and phenacetin, usually to subjects in a water-depleted state. The phenacetin metabolite p-phenetidin exhibits high renal toxicity; it injures cells by covalent binding and oxidative damage. These papillotoxins target interstitial cells via hydroperoxidase-mediated activation. Aspirin induces its potentiating effect by inhibiting the vasodilatory effects of prostaglandin, thus predisposing the papilla to ischemia. Therefore, papillary damage may be the result of a combination of the direct toxic effects of phenacetin metabolites and ischemic injury to both tubular cells and vessels. Grossly, the cortex exhibits depressed areas that represent cortical atrophy overlying the raised necrotic papillae. The papillae within the kidney show various stages of necrosis with calcification, fragmentation, desquamation, and sloughing. This development contrasts with the papillary necrosis observed in patients with diabetes, whose papillae are generally at the same stage of acute necrosis at any given time. Microscopically, the individual papillary changes range from a patchy appearance to the advanced form, wherein the entire papilla is necrotic. When the papillae remain attached, they are structureless masses with ghosts of tubules and foci of dystrophic calcification. These tubules and calcifications subsequently fragment and slough, becoming potential obstructive entities. The cortical columns of Bertin that contain the glomeruli characteristically remain uninvolved. Certain papillotoxins target interstitial cells, resulting in hydroperoxidase-mediated activation with subsequent inflammatory, degradative, and necrotic cell changes. Renal papillary necrosis has a variable clinical course that ranges from a chronic, protracted, and relapsing form to an acute, rapidly progressive form. The acute progressive form is particularly rare, but the effects are devastating, resulting in death from septicemia and renal failure. Patients with the more common chronic form may remain asymptomatic until diagnosed incidentally through the appearance of a ring shadow on a radiographic image, by the passage of sloughed papillae in the urine, or during autopsy. The symptomatic form manifests as episodes of pyelonephritis and hydronephrosis, and it mimics nephrolithiasis. The most common presenting symptoms in symptomatic patients include fever and chills, flank and/or abdominal pain, and hematuria. Acute renal failure with oliguria or anuria is rare; when these symptoms develop, the disease may be fulminant, requiring dialysis and potentially resulting in death. If renal function deteriorates suddenly in a patient with confirmed diabetes or in a patient with a known history of chronic obstruction and/or pyelonephritis, consider the diagnosis of papillary necrosis, even if the patient is asymptomatic. Acute ureteral obstruction from sloughed papillae manifests as flank pain and colic due to hydronephrosis or pyonephrosis; hematuria is invariably present. Pyonephrosis or secondary acute or relapsing pyelonephritis compounds the presentation with fever, chills, prostration, and sepsis. The differential diagnoses of flank pain or hematuria includes a plethora of conditions with infectious, neoplastic, congenital, metabolic, and hematogenous sources. Intraluminal and extraluminal lesions may result in ureteral obstruction. If acute ureteral obstruction manifests as hematuria, colic, and flank pain, consider that nephrogenic calculi may have embolized to the ureter. Approximately 15% of all calculi, particularly uric acid stones, are not radiopaque (ie, visible on radiographs); therefore, the examining clinician needs to perform further imaging studies for an accurate identification. CT scanning is an excellent imaging modality for identifying all calculi (including uric acid stones),  except for the rare indinavir (Crixivan) crystal concretions that form in the ureters of patients with HIV infection who are taking this protease inhibitor. If calculi are not seen on a CT scan, consider the possibility of an obstructing urothelial tumor; cytology and endoscopic procedures help to determine this diagnosis. Blood coagulum downstream from a bleeding source in the kidney (eg, renal cell carcinoma, angioma, angiomyolipoma, arteriovenous malformation, trauma to a pyelonephritic or multicystic kidney) can also manifest with a similar clinical picture. If a patient has acute ureteral obstruction with fever and leukocytosis, the preferred treatment is drainage of the system. Pyonephrosis may or may not be present; therefore, the initial short-term management of an obstructed system should be conservative, with resuscitation, drainage, and intravenous antibiotics. Further diagnostic studies can be performed later, once the physician is certain that the system is sterile. This strategy prevents further clinical deterioration. Extraureteric causes of ureteral obstruction include retroperitoneal lymphadenopathy from metastatic tumors or lymphoma, retroperitoneal fibrosis, uterine myoma, bladder masses, and high-stage pelvic tumors (eg, cervical cancer). Anything that causes severe bladder outlet obstruction leads to bilateral hydronephrosis or hydronephrosis of a solitary kidney. Congenital anomalies can also directly obstruct or provide stasis that may lead to pyelonephritis and papillary necrosis. Duplicate collecting systems, vesicoureteral reflux, and ureteroceles are important offenders to consider. In the clinical scenario of fever, chills, prostration, and sepsis without hydronephrosis, the differential diagnoses include pyelonephritis, perinephric abscess, renal hemorrhage, tubulointerstitial nephritis, and glomerulonephritis. In asymptomatic patients who present with acute renal failure characterized by azotemia, the physician must consider bilateral obstruction or the presence of a solitary obstructed kidney. Renal ultrasonography is a wise first test in this scenario, along with tests for urine and plasma urea, creatinine, sodium, and osmolality. After excluding postrenal causes, consider prerenal and renal sources. Briefly reviewing basic renal anatomy and histology allows a clear understanding of the pathophysiology of the underlying ischemia of renal papillary necrosis and how this ischemia is distributed. The renal papilla is the rounded apex of each medullary pyramid and represents the confluence of the collecting ducts from each nephron within that pyramid. An individual minor calyx cups each papilla; these calyces represent the most proximal aspect of the renal collecting system and are lined with transitional cells. The renal papillary blood supply is derived from 2 sources: the vasa rectae, which disperse blood from the efferent arteriole, and the interlobar branches of the renal artery, which run within the adventitia of the minor calyces. The vasa rectae arise from the efferent arteriole within the renal cortex and form wide and plentiful vascular bundles at the base of the medullary pyramid. The bundles taper as they continue distally toward the apex and papilla. This process results in the papillary tip receiving only a marginal supply of blood, which appears to be a predisposing factor for the central role of ischemia in the development of renal papillary necrosis. The already tenuous vasculature is further impaired by several pathophysiologic states, including the above-described boggy inflammatory interstitium of pyelonephritis, the microangiopathy of diabetes mellitus, the increased pyelovenous pressure of urinary obstruction, the chronic hyperbilirubinemia of liver cirrhosis, the oxidative damage of analgesic nephropathy, and the intraluminal stasis of sickle cell disease. Patients with known or suspected renal papillary necrosis should limit or completely avoid the use of analgesics. Other nephrotoxic medications should also be avoided. The routine use of indwelling catheters should be discouraged except when clinically indicated. Clean intermittent catheterization, although more time-consuming, is equally effective for the purpose of monitoring output is less likely to cause nosocomial urinary tract infection. In patients with obstructed collecting systems who are hemodynamically unstable, obtunded, and floridly septic, avoiding any retrograde instrumentation of the ureter, such as stent placement, should be seriously considered. Unnecessary retrograde instrumentation is discouraged because of the risk of irrigating purulent or contaminated urinary inoculum from the lower urinary tract into the renal pelvis and pyelovenous system, exacerbating urosepsis. In general, patients who are more ill should preferably be treated with antegrade percutaneous nephrostomy placement. However, an uncorrectable concomitant coagulopathy may preclude any percutaneous procedures, considering the potential morbidity of renal hemorrhage. Attempt correction of any coexisting coagulopathy prior to percutaneous nephrostomy. In patients with hemodynamic instability who have a grossly infected and obstructed collecting system with an uncorrectable coagulopathy, the problem is more dire and a truly effective treatment remains elusive. These patients are probably best treated with retrograde stent placement to avoid a potentially lethal renal hemorrhage. In the severely ill patient, perform the quickest and safest procedure to establish drainage of the hydronephrotic section. This means that carefully considered retrograde procedures are sometimes the preferred modalities. Broad-spectrum intravenous antibiotics administered immediately prior to any retrograde study may have a protective effect. Friedrich N. Ueber necrose der nierenpapillen bei hydronephrose. Virchows Arch A Path Anat. 1877. 69:308-12. Gunther GW. Die papillennekrosen der niere bei diabetes. Munchen Med Wochenschr. 1937. 84:1695-9. Edmondson HA, Martin HE, Evans N. Necrosis of renal papillae and acute pyelonephritis in diabetes mellitus. Arch Intern Med. 1947. 79:148. Spuhler O, Zollinger HU. [Chronic interstitial nephritis.]. Z Klin Med. 1953. 151(1):1-50. [Medline]. von Seyfried I. Autopsy protocol of Ludwig van Beethoven, translated from Latin. Ludwig van Beethovens Studien im Generalba. 2nd ed. Contrapunkt und in der Compositions: 1852-1853. Davies PJ. Beethoven's nephropathy and death: discussion paper. J R Soc Med. 1993 Mar. 86(3):159-61. [Medline]. Schwarz A. Beethoven's renal disease based on his autopsy: a case of papillary necrosis. Am J Kidney Dis. 1993 Jun. 21(6):643-52. [Medline]. Barnes DJ. Beethoven's final illness. Lancet. 1996 Mar 16. 347(9003):766. [Medline]. Mandel EE. Renal medullary necrosis. Am J Med. 1952 Sep. 13(3):322-7. [Medline]. Simon HB, Bennett WA, Emmett JL. Renal papillary necrosis: a clinicopathologic study of 42 cases. J Urol. 1957 Apr. 77(4):557-67. [Medline]. Delfino VD, Santiago NM, Mocelin AJ, Kunii LF, Bortoliero AL. Indinavir-associated toxicity mimicking urinary tuberculosis in a patient with AIDS. Braz J Infect Dis. 2008 Feb. 12(1):99-100. [Medline]. Iba-Ba J, Yombi JC, Danse E, Van Beers B, Vandercam B. [Bilateral papillary necrosis during indinavir treatment]. Presse Med. 2008 Jun. 37(6 Pt 1):967-9. [Medline]. Lang EK, Macchia RJ, Thomas R, Davis R, Ruiz-Deya G, Watson RA. Detection of medullary and papillary necrosis at an early stage by multiphasic helical computerized tomography. J Urol. 2003 Jul. 170(1):94-8. [Medline]. Lang EK, Macchia RJ, Thomas R, Davis R, Ruiz-Deya G, Watson RA, et al. Multiphasic helical CT diagnosis of early medullary and papillary necrosis. J Endourol. 2004 Feb. 18(1):49-56. [Medline]. Ulreich S. Ultrasound in the evaluation of renal papillary necrosis [letter]. Radiology. 1983 Sep. 148(3):864. [Medline]. Falkenberg FW, Hildebrand H, Lutte L, Schwengberg S, Henke B, Greshake D, et al. Urinary antigens as markers of papillary toxicity. I. Identification and characterization of rat kidney papillary antigens with monoclonal antibodies. Arch Toxicol. 1996. 71(1-2):80-92. [Medline]. Price SA, Davies D, Rowlinson R, Copley CG, Roche A, Falkenberg FW, et al. Characterization of renal papillary antigen 1 (RPA-1), a biomarker of renal papillary necrosis. Toxicol Pathol. 2010. 38(3):346-58. [Medline]. Garber SL, Mirochnik Y, Desai SS, Arruda JA, Dunea G. Angiotensin-converting enzyme inhibition reduces the effect of bromoethylamine-induced papillary necrosis and renal fibrosis. J Am Soc Nephrol. 1998 Jun. 9(6):1052-9. [Medline]. Abe K, Ozono Y, Miyazaki M, Furusu A, Shioshita K, Sasaki O, et al. Prostaglandin E1 for renal papillary necrosis in a patient with diabetes mellitus. J Int Med Res. 1999 Mar-Apr. 27(2):90-5. [Medline]. Akhund L, Quinet RJ, Ishaq S. Celecoxib-related renal papillary necrosis. Arch Intern Med. 2003 Jan 13. 163(1):114-5. [Medline]. Bing RJ. Cyclooxygenase-2 inhibitors: is there an association with coronary or renal events?. Curr Atheroscler Rep. 2003 Mar. 5(2):114-7. [Medline]. Breyer MD, Hao C, Qi Z. Cyclooxygenase-2 selective inhibitors and the kidney. Curr Opin Crit Care. 2001 Dec. 7(6):393-400. [Medline]. Hagiwara N, Fujihiro S, Deguchi T. [Renal papillary necrosis managed by transurethral procedures: a case report]. Hinyokika Kiyo. 2003 Jun. 49(6):329-31. [Medline]. Kamath S, Moody MP, Hammonds JC, Wells IP. Papillary necrosis causing hydronephrosis in renal allograft treated by percutaneous retrieval of sloughed papilla. Br J Radiol. 2005 Apr. 78(928):346-8. [Medline]. Kankuri E, Solatunturi E, Vapaatalo H. Effects of phenacetin and its metabolite p-phenetidine on COX-1 and COX-2 activities and expression in vitro. Thromb Res. 2003 Jun 15. 110(5-6):299-303. [Medline]. Kovacevic L, Bernstein J, Valentini RP, Imam A, Gupta N, Mattoo TK. Renal papillary necrosis induced by naproxen. Pediatr Nephrol. 2003 Aug. 18(8):826-9. [Medline]. Lange S. Differential Diagnosis: Urographic findings. Lange S, ed. Teaching Atlas of Urologic Radiology. First ed. New York, NY: Thieme Medical; 1995. 198-203. Lindvall N. Radiological changes of renal papillary necrosis. Kidney Int. 1978 Jan. 13(1):93-106. [Medline]. Salo JO, Talja M, Lehtonen T. Ureteroscopy in the treatment of ureteral obstruction caused by papillary necrosis. Eur Urol. 1987. 13(1-2):140-1. [Medline]. Voulgarelis M, Ziakas PD. Images in clinical medicine. Renal papillary necrosis unmasking sickle cell disease. N Engl J Med. 2005 Mar 24. 352(12):1237. [Medline]. Wen SF. Nephrotoxicities of nonsteroidal anti-inflammatory drugs. J Formos Med Assoc. 1997 Mar. 96(3):157-71. [Medline]. Zadeii G, Lohr JW. Renal papillary necrosis in a patient with sickle cell trait. J Am Soc Nephrol. 1997 Jun. 8(6):1034-9. [Medline]. Cystoscopic photograph of sloughed papilla extruding from the ureteral orifice. The patient was a 51-year-old man with poorly controlled diabetes and a history of microhematuria and an acute onset of severe left flank pain. Findings of upper tract imaging with a renal ultrasonography and intravenous pyelography were remarkable only for mixed heterogeneity consistent with medical renal disease. Urine cytology results were negative, and culture showed no growth. In-office flexible cystoscopy revealed the mass extruding from the left ureteral orifice, which required sedation and rigid cystoscopy to extract. Gross examination yielded a tan, friable, irregular, wedge-shaped soft tissue mass 1.7 cm X 1.6 cm X 1.5 cm. Bilateral retrograde pyelography revealed a clubbed left upper pole calyx and no other filling defects. The pathology was necrotic epithelial tissue.